First thing this morning we reported that as part of the global bond selloff, overnight Japan's 10-year bond yield briefly rose by more than 2bps above 0.10%, the highest since July 11, with traders commenting that any sustained increase in the 10-year yield to 0.1% would test speculation that the BOJ will offer to buy unlimited amount of bonds for fixed rates. Well, the BOJ did not do that, but in a clear indication that the BOJ will not tolerate further upside pressure on JGB yields, as part of today's "rinban" or BOJ equivalent of POMO, the BOJ boosted bond purchases in the 3-5 year bucket from 300BN yen to 330BN yen. 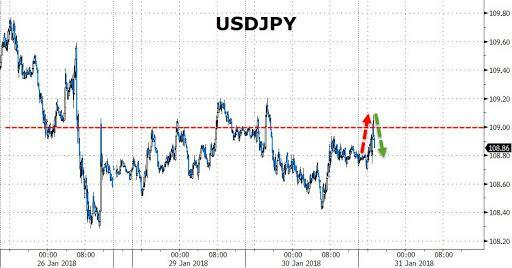 This was the first increase in this bucket since July, and follows a 10BN yen reduction in bond repurchases in the 10-25Y bucket on January 9, which spooked traders that the BOJ was sending its latest tapering signal. While the move led to an immediate move higher in the USDJPY, all the gains have since faded. More to the point, the yield on the 10Y JGB dipped modestly, and after trading a little over 0.09% it was last trading at 0.087%, well below the BOJ's 0.1% redline. Commenting on the BOJ's POMO "intervention" Barclay's rates strategist Naoya Oshikubo said that the Bank of Japan’s operation "clearly shows its intent to rein in domestic government bond yields" adding that the "BOJ was clearly mindful of the 10-year yield approaching 0.1%"
But why the 3-to-5 zone? Because according to Oshikubo, since today’s regular operations didn’t include 5-10 year sector, the BOJ probably used the 3-5 year sector to show its stance, as the 5-year yield is close to the 10-year one and can have impact. Finally, the Barclays rates strategist predicted that similar operations are likely in future if yields rise. Still, he warned that while the BOJ’s action can offer some relief to markets but the real cause of yield rise is higher U.S. yields, where prospects are unclear.